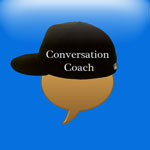 ﻿ Silver Lining Multimedia, Inc.
Use the Conversation Coach to teach the back and forth flow of a conversation. It can also be used as a basic aac device. Our photo software collection contains thousands of photos designed for teaching language, behavioral rules and everyday living skills. The CDs are more than just a collection of photos. They contain premade templates for common communication tools such as photo schedules and checklists plus cards for ABA therapy, early intervention, and picture exchange. 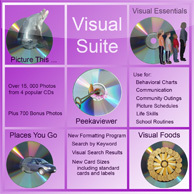 Our latest DVD, Visual Suite, contains Picture This Professional, Visual Essentials, Visual Foods and Places You Go. Plus keyword searches with thumbnail results. Use our Great Action Adventure CD to teach verbs, related nouns, sign language and beginning reading. This software uses ABA (applied behavioral analysis), a systematic teaching method which has been proven to work well with autistic students. The CD is also great for any early intervention student who responds well to distraction-free teaching methods. Teaching students to tell time is a lot easier with our patented Teaching Hands Clock. The hands have specially-designed loops on the ends to guide the student's eyes to the correct hour and minute numerals. In addition to clocks, we also carry the Time Timers which are a great visual tool for keeping students on task and organized. Many special ed and autistic students have difficulties understanding social skills. Our collection of social skill CDs and DVDs help to demonstrate proper social skills at home, school and in the community. Tying shoes is actually a fairly complicated task, but when broken down into small steps, it can be mastered by anyone. Our special laces and board help students to see where to move and hold the laces. From magnet boards to chore charts, we have tools to help with education and organization. Once you've gathered all of the pictures that you need for teaching and augmentative communication, you will need a way to display and carry them. We have a wide range of fabric and wooden photo holders which will hold up to the rough use of students who like to bend, bite and chew on photos. Our 10-second recorders work well with picture schedules or for phrases that your student uses frequently. They can be used for teaching language or for augmentative communication. We offer educational videos for teaching social skills and early language. In addition to DVDs for students, we also have DVDs for teachers and parents looking for new teaching techniques and visual strategies. Our books will help you to learn or improve the visual strategies that you use with your autistic and special needs students. Learn how to use photos for behavioral interventions, picture schedules, independent activity schedules and academics. Need some ideas about how to use our software, Check out these videos. 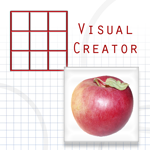 Use our photo and interactive software to unlock the true potential of visual learners. Since 1998 our software products have been helping special needs individuals to learn language and communicate with photos. All of our products are designed for students who learn well with materials which contain clear visuals and prompts. Our distraction-free photos with plain backgrounds are ideal for making photo schedules, communication boards and picture exchange cards. They are also perfect for teaching life skills such as toilet training, dressing, cooking and chores. In addition to software, we offer educational materials such as the Teaching Hands Clock which are designed for students who need visual prompts. Our products are ideal for those with autism, brain injury, CP, Down Syndrome, developmental delays, aphasia and other conditions requiring augmentative communication. Our photo software is also a great way to teach new words to ESL and special education students. Use our photo and interactive software to unlock the true potential of visual learners. We have thousands of photos that are ideal for teaching vocabulary and communication. Our latest DVD, Visual Suite contains over 15, 000 images and 4 of our most popular CD collections. Copyright © 2010 Silver Lining Multimedia, Inc. All Rights Reserved.